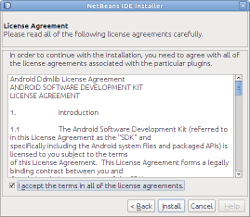 NetBeans AutoUpdate is the best approach to install NBAndroid plugin into your IDE. It installs everything and also provides a way how to keep it uptodate. 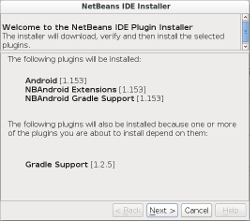 You will need NetBeans version 7.3 or newer installed (7.3, and 8.0 were tried successfully). Java version 7 is required as the JDK used by NetBeans (you can still build your Android applications using older version of Java). Android SDK needs to be installed separately too. Previous update center hosted at kenai.com site is removed now as it caused confusion about current version and what is supported and what not. Tip: keep 'Check for updates automatically' option selected to get the updates. Once the URL is added navigate to Available Plugins tab in the same dialog. 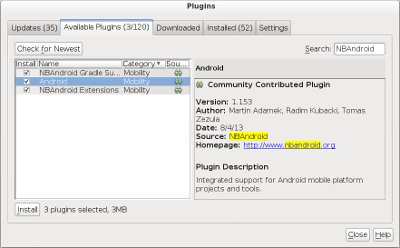 Find Android plugin here and select it for installation. Optionally you can install NBAndroid Extensions as well to get some extra functionality. 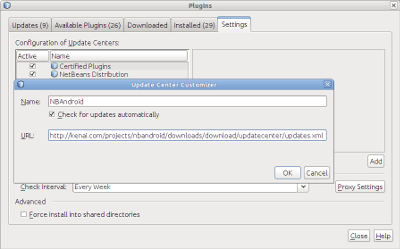 Note that subscription is required to enable features provided by NBAndroid Extensions. 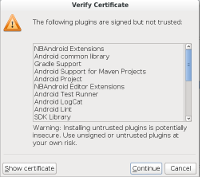 to verify the certificate (the plugin is signed with a certificate that is not trusted). This is an alternative useful if you cannot connect to our download area directly from IDE. Download a snapshot of project binaries from archives folder. Then go to Tools | Plugins | Downloaded and add NBM files from unzipped archive. The rest is the same as described above. Most of the functionality in Android support requires a path to Android SDK to be configured. Go to Tools | Options dialog and its Miscellaneous category. Here you will find Android tab where you can specify the location of Android SDK. Note: Android SDK folder is a folder containing SDK tools, platform tools, and platforms among the other things. It usually contains sub-folders names build-tools platforms platform-tools tools. Note: Make sure both Android SDK Tools and Android SDK Platform-tools packages are installed in your Android SDK. Some SDK downloads do not contain platform tools and you need to install them. Simply run $ANDROID_SDK_HOME/tools/android and install it from this UI. 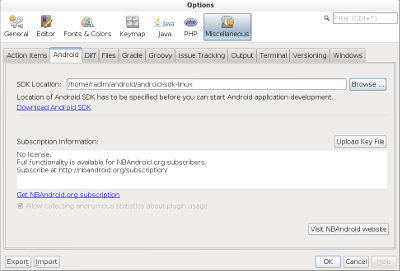 If you've installed NBAndroid Extensions you need to upload subscription key in this dialog to activate the functionality. Of course this is optional. Specifically note that there is no Java platform definition needed or possible. This concept was abandoned a while ago yet there are still some pages and outdated tutorials mentioning this.